I’m super over the roof excited to share my big news with you… today a second craft kit of mine is being released in Jo-Ann stores! 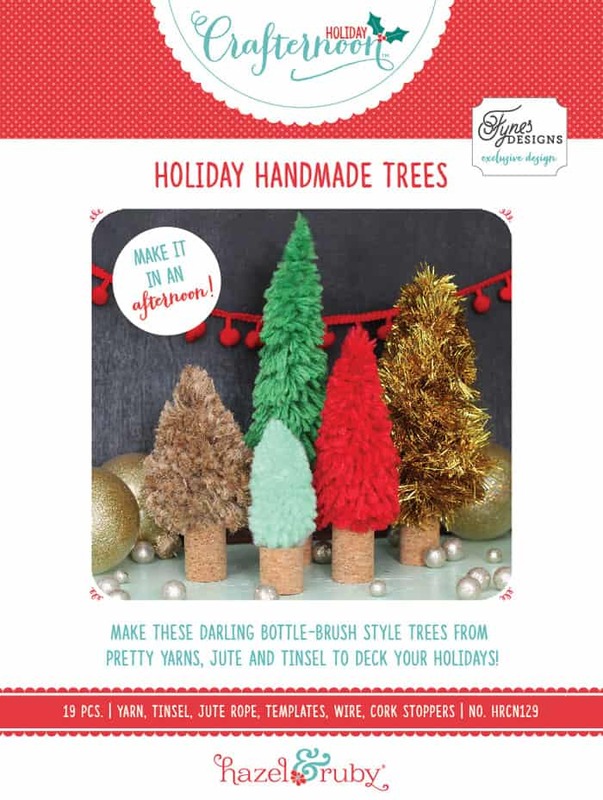 This time I’ve created a DIY Bottle Brush Trees kit along with my friends at Hazel and Ruby. After designing my embroidery kit that was released in the summer, I knew I had to design one for my favourite crafting time of year. Christmas oozes from every pore so I was over the moon when I got to design this Holiday Handmade Trees kit too! Don’t they look super fun?! 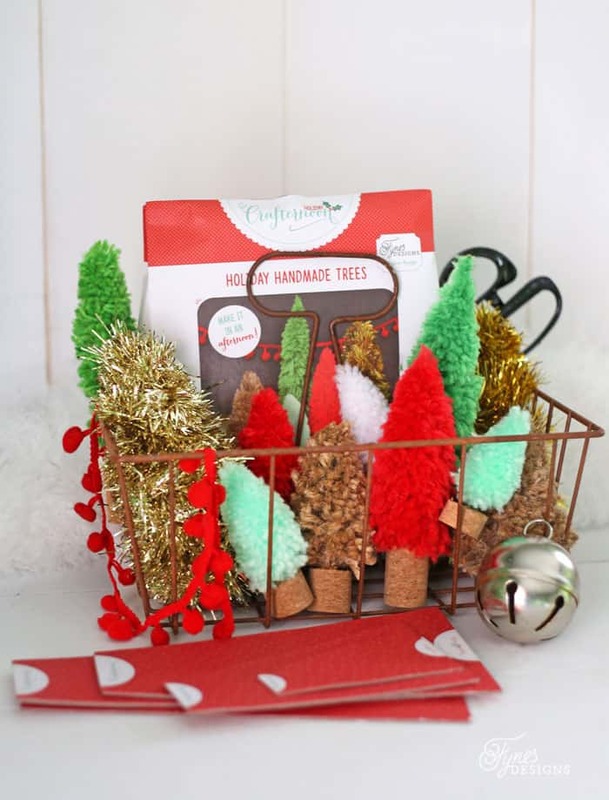 The kit includes everything to make 5 holiday trees, from yarn, tinsel, and jute; you’ll just need to provide a pair of scissors and pliers. Get yours on Joann.com right now! These Holiday Handmade Trees are super easy to make, they won’t even take you an afternoon. Plus once you have the kit tree forms, you can make dozens with materials you probably already have at home! There are loads of uses for these little DIY bottle brush trees. You can use them to style a vignette, or add to a sweet village. 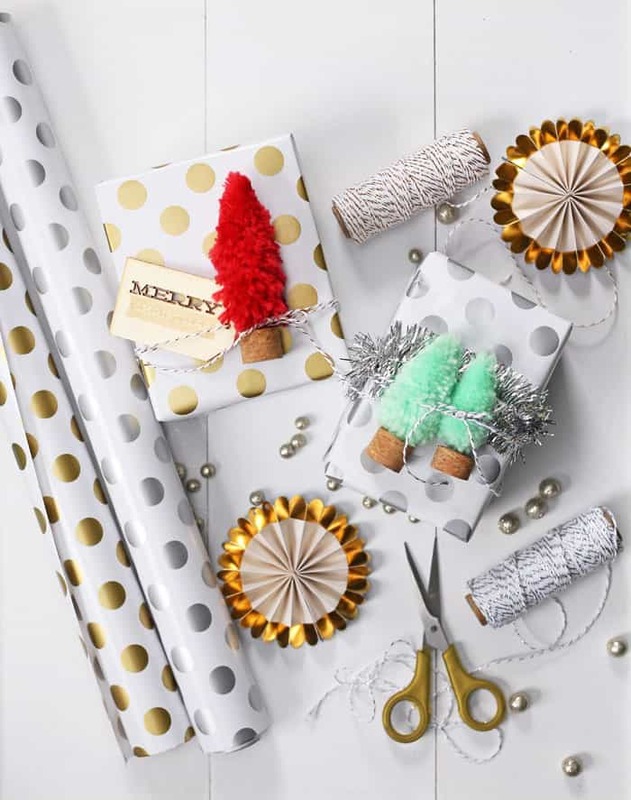 Use them on your gift wrapping for a little flair, decorate your little trees with bulbs (vase filler) garland (pipe cleaners, or bead strands) glass glitter and a cute star on top! 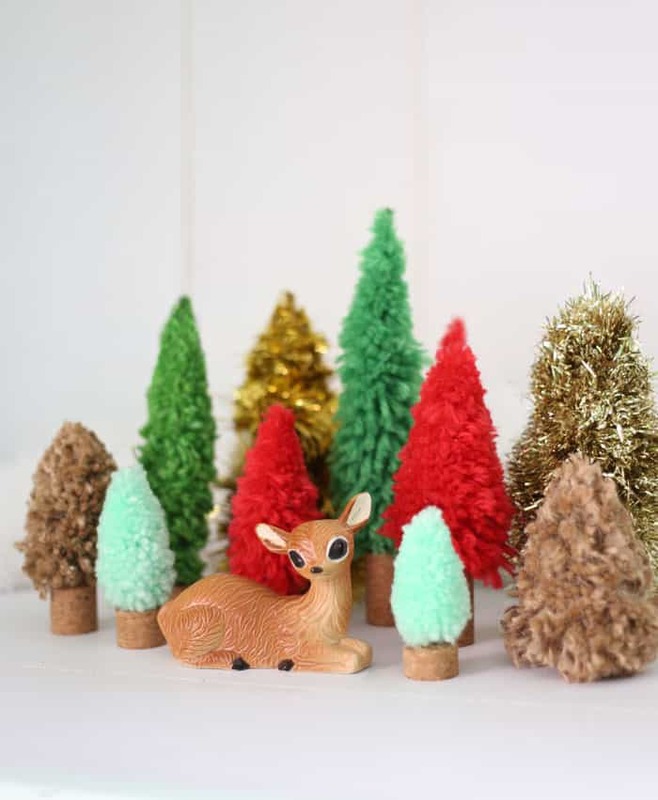 Cut the cork stumps at varying heights using a craft knife to add different heights to your little forest. I can’t wait to see what you do with your little holiday handmade trees! Be sure to follow along on Instagram and Facebook for fun giveaways and Crafternoon ideas using #holidaycrafternoon #makeitinanafternoon and #hazelandruby. CLICK HERE to get your Holiday Handmade Tree Kit, or head into a Jo-Ann Fabric and Craft store near you to grab one! But wait there is more… 6 of my other blogging friends are releasing Crafternoon kits too! We want you to have a chance to win the entire Crafternoon Holiday collection! Hop along to each blogger to check out their Crafternoon project, enter to win on Hazel and Ruby so you can get crafting with us! I have always wanted to learn how to make these so I am uber excited!!! Can’t wait till I can get my hands on this kit!!!!! TFS! yayy! Can’t wait to see how you use them! Love, love the bottle brush trees!! Using them on the packages is a wonderful idea!! Thanks Mary Ann, I can’t wait to get deep into to Christmas mode, I’ll be adding them to everything! CONGRATULATIONS on having your FUN trees transformed into an FABULOUS & FUN kit Virginia!!! Love the trees. Combining brush trees and pompoms. What’s not to love. Seriously, two of my favourite things!! I really have a bottle tree addiction-these are a must have. Love the small ones-already seeing them in mason jar snow globes. Home run! This is SO great! Congratulations. What a wonderful idea. It’s one of those idea I wish I had come up with 😉 haha. Pinning this! So cute…what a great idea!!! LOVE this idea!!! What a cute kit! Just love this and so so so exciting to see it being sold as a kit! Congrats. Oh my gosh, this is so adorable. Good for you- it must be so amazing to design things like this and see it come to fruition!! Like, as actual products in a store. SO COOL!! Oh my goodness! SO, SO cute! Okay first off, how freakin’ exciting that you have your own craft kit at JoAnn’s! That’s awesome! 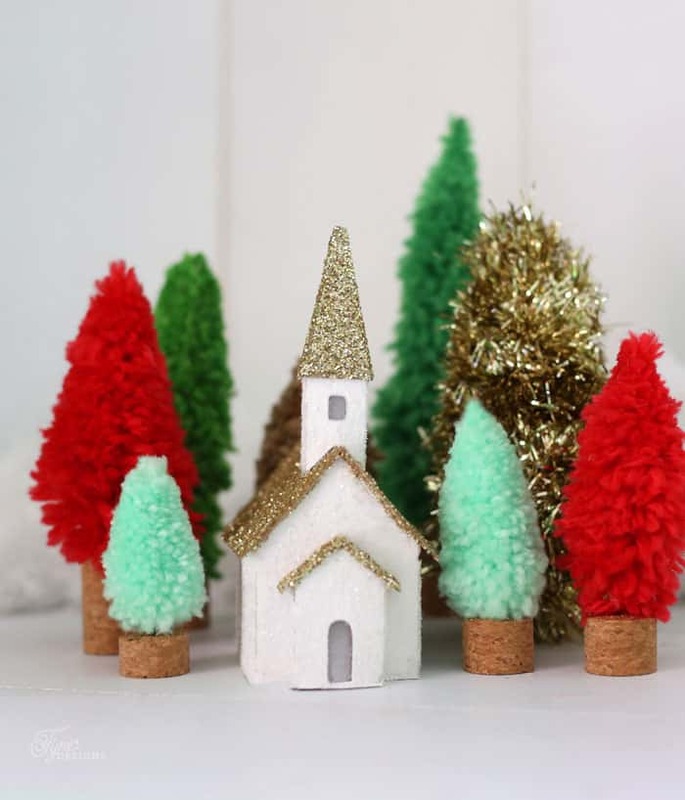 I’m a sucker for bottle brush trees and this looks like such a fun holiday craft. Thanks Kaite, it is super fun!! And super fun to see something I created in a store! Love these trees! They are fantastic, I can see a forest of them on my mantle. How exciting for you! The kit looks like lots of fun to work with. Thanks for sharing at Snickerdoodle Sunday. Pinned and Tweeted. These are so, so cute! Oh my! I am really tempted to purchase one of these next time I am in Joann’s!! How exciting for you, too! What a big opportunity this is!!!! Thanks, I know it is such a bummer. Jo-Ann gets first crack at the can for selling them, but will later become available at other retailers. I hope you can get your hands on one! Congratulations!! These are just the cutest things ever. Oh my gosh, they’re pom pom trees!! How fantastic is this?? Thank you so, so much for partying with us at Snickerdoodle Sunday- can’t wait to see what you’ve got next this weekend! These look like so much fun to make…my girls would love it! Thanks so much for sharing your cute craft at Share The Wealth Sunday! beautiful! It’s easy and pretty! I love those little trees. I do not live in the US so I can’t get the kit but I did see how you made them…I’ll need to give it a try! Thats so cool. It will be great exposure! Thanks for linking up at the Best of the Blogosphere Linky party! Oh, I love these!! I would love to have you share at my new link party: http://craftymomsshare.blogspot.com/2015/11/crafty-weekends-half-yard-christmas.html. What a sweet idea! I think they’re darling! Thanks for sharing on Throwback Thursday!